WE Offer Roof Restorations or Roof Painting if you prefer in all areas around bunbury and surrounding areas, including but not limited to Eaton, Australind, Boyanup, Dardanup and Donnybrook. 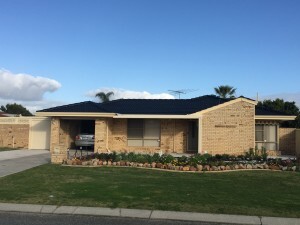 We offer full roof restoration services for your roof, whether it is your family home, or your investment home we can take care of the details for all aspects of the roof, call the team at WA External Solutions and we will come to you, we also offer Patios – both timber and sleek metal patios, fully lined if you prefer. we also have a quality team doing Timber deckng, both in Ekodeck or natural timbers like merbau or jarrah. top this off with colorbond fencing and you will see that the team at WA External Solutions can offer you a range of services for the external of your house and living areas.Call now for a obligation free quote 1300 660978.